May 23, 2011 - Sustainable Oils announced that hydrotreated renewable jet fuel (HRJ) made from its camelina power two Air Force F-16 aircraft as part of a Thunderbirds demonstration flight on Friday at the Joint Services Open House. It is the first time renewable fuels have ever been used as part of a Department of Defense Aerial Team show. The camelina was grown and harvested in Montana, and refined into renewable jet fuel using technology from UOP, a Honeywell company. 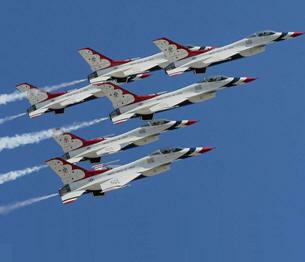 The Thunderbirds are the air demonstration squadron of the U.S. Air Force (USAF), based at Nellis AFB in Las Vegas, Nevada. The squadron tours the United States and much of the world, performing aerobatic formation and solo flying in specially-marked USAF jet aircraft. The name is taken from the legendary creature that appears in the mythology of several indigenous North American cultures. Sustainable Oils, is a producer and marketer of renewable, environmentally clean, and high-value camelina-based renewable fuels. Sustainable Oils is focused on the continued research and development of dedicated energy crops such as camelina. Sustainable Oils solidly supports both agricultural and green energy initiatives with camelina, which is efficiently and economically grown in rotation with wheat and even on marginal lands, harvested with traditional equipment, and requires minimal water.